In a robotic world, genuine rock 'n' roll is still worthy of acclaim. These days, the household names are Kurt Vile, The War on Drugs, and Courtney Barnett, but we might want to add Strand of Oaks to that list. Half a decade on from the numerous accolades garnered by HEAL and two years after his last album, Hard Love, Timothy Showalter conquered enough bleakness to make the enraptured Eraserland. "The problem with living," Showalter sings during the wrenching, shimmering climax ending "Forever Chords," "is one day you won't." Strand of Oaks got real, but hopes that moments of bliss outshine the bad. Showalter recorded Eraserland live in Kevin Ratterman's Louisville studio room with every player from My Morning Jacket except Jim James as his backing band. Tom Blankenship (bass), Patrick Hallahan (drums), Bo Koster (keys). and Carl Broemel (guitar) help Showalter get through all the highs and lows. The Jersey Shore seems like an odd location for a personal crusade, but Showalter was there walking on the beach for days, wondering if Hard Love was the last album he would make. Broemel started having conversations with Showalter—My Morning Jacket toured with Strand of Oaks in 2015—which provoked creativity. 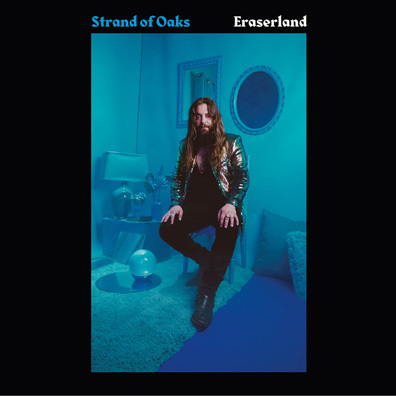 Although Showalter's voice is deeper than James's and the arrangements on Eraserland are somewhat different than what My Morning Jacket produces, it's hard to not pretend that Strand of Oaks' sixth album is a new record from the aforementioned band. As hair on the back of the neck is lifted during "Visions," it's hard not to wonder what Jim James thinks of his band backing a different personality.